Hi Lovelies! Today I want to share some good news with you! Zoya is giving out THREE free nail polishes with code! you’ll get an ADDITIONAL free nail polish for free!!! Amazing right? Usually per nail polish is $8-9 dollars. 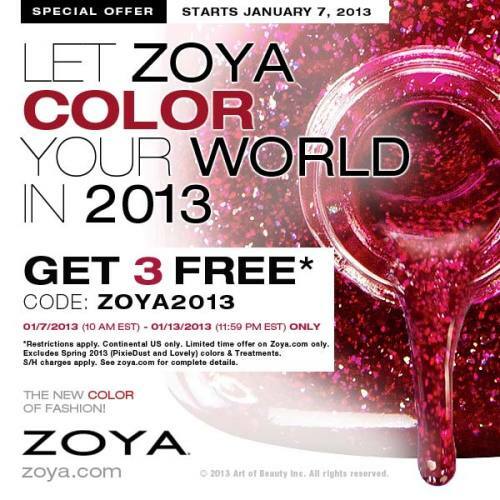 With Code: Zoya2013 You’ll get them all for free! All you have to do is pay for shipping and handling of $10. & if you want to save on shipping, buy $25 worth of items, you get free shipping! Which means you can buy 3 nail polishes ( or whatever you want for $25 or more) & get 3 nail polishes for FREE! To get the $25 limit is simple. since most nail polishes are $8, it will add up to $24 with three nail polishes. If you select one of the items with a $9 nail polish, such as a the new pixie dust collection, you’ll make the $25 limit! Zoya Nail Polish in Luna can be best described as: Light, shimmering sheer silvery dove gray base loaded with shiny silver glitter. A totally glam silver for a look that's out of this world! Offer ends Jan 13th 2013 !!!!!! Let me know if you’re going to get the free nail polishes & what colors you got! Are you going to get the free nail polishes?